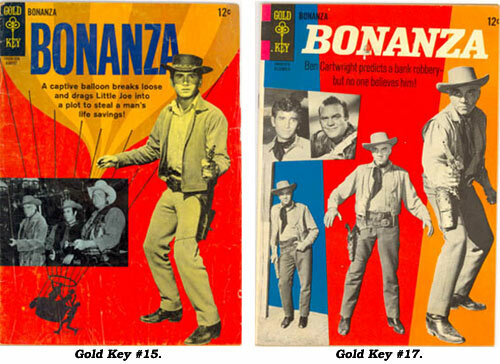 “Bonanza”, the second longest running western TV series, began September 12, 1959. 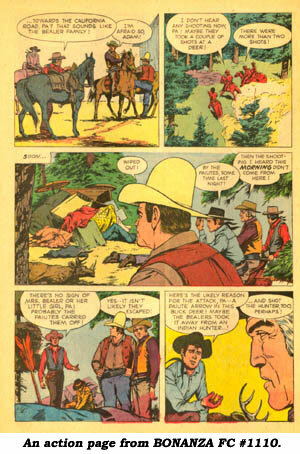 Dell, the biggest proponent of TV-based western comics, rode onto the Ponderosa in June/August ‘60 with Four Color #1110. 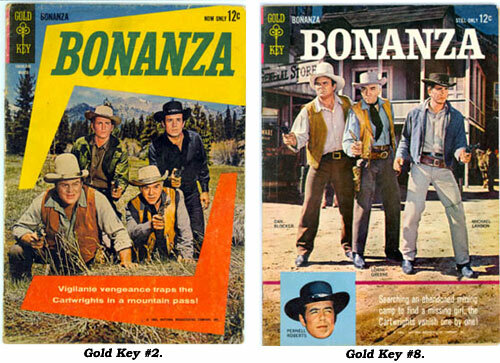 However, another BONANZA issue didn’t hit newsstands until over a year later, FC #1221 for Sept./Nov. ‘61, just as “Bonanza” moved to Sunday night on TV. Why the year long wait between issues remains a mystery. (June/July ‘66). #21-#37 were once again published quarterly—ending in Aug./Oct. ‘70 just as season 12 of “Bonanza” began. However, readers could see the end coming as issues #25 (Aug./Oct. ‘67) through #34 consisted of reprint material, often retouching the art to eliminate Adam from the original artwork, or sometimes adding a mustache to the original art and changing Adam’s name in the text balloons. This was of course due to the fact Adam (Pernell Roberts) left the TV series in ‘65. For more evidence of this chicanery, check the covers of FC 1283 and Gold Key #23 below. 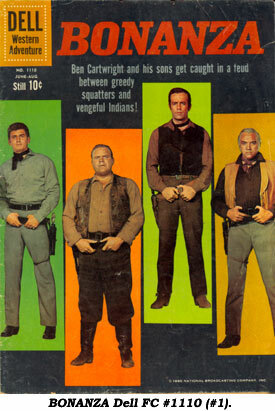 It’s the very same photo but Pernell Roberts is removed from the picture on the latter cover. 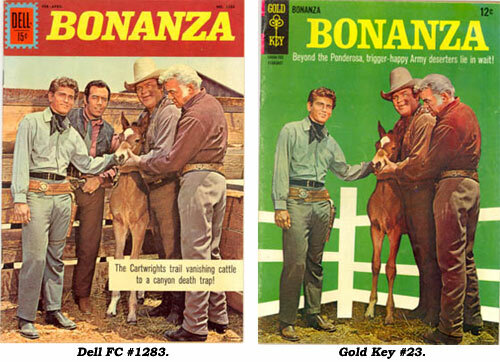 Dell’s BONANZA reverted back to original stories as a last resort to save lagging sales with #35-#37. 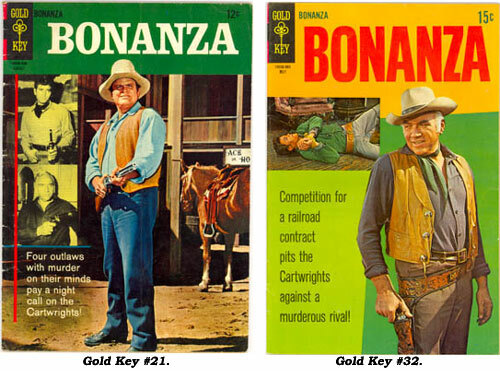 Stories for most of BONANZA’s total 42 issue run were primarily written by the equally prolific Gaylord DuBois and Paul Newman. Much of the satisfactory but never stimulating artwork was by Tom Gill (1913- ) and inked by Herb Trimpe (1939- ). Photo covers on all 42 issues with back cover photos as well on Gold Key 1-9 and 11. The first Dell issue (FC 1110) will cost you about $90 in Fine with the other four Dells running about $50 each. Gold Key #1-#10 are around $25, #11-#20 $18 and the rest of the run (including the reprint/altered art issues) bringing about $15 each.